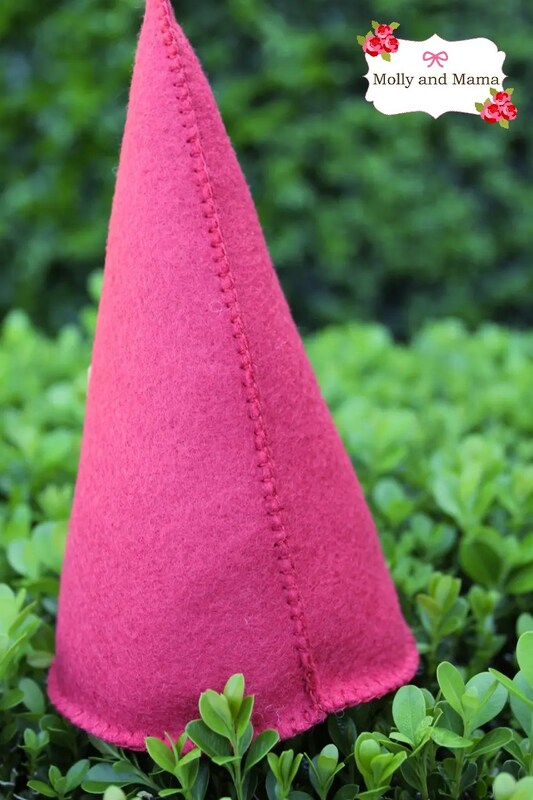 Today I’m reviewing a gorgeous little gnome pattern from the lovely Chrissy of Muse of the Morning, as part of her Pattern Tour. She has such a fantastic collection of downloadable PDF patterns, that it was difficult to select just one to review. There are clothes, costumes, dolls, softies and more. 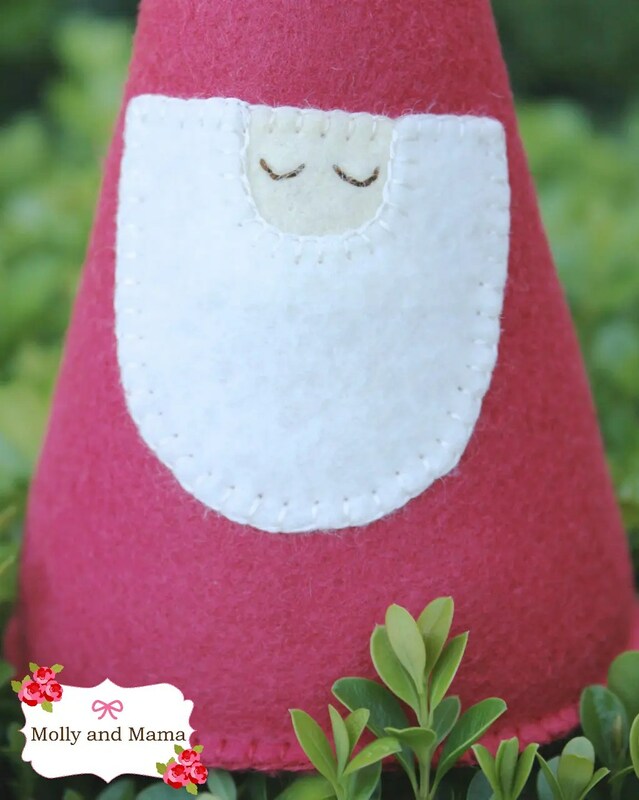 But we all know how much I love working with felt, so the whimsical little gnomies in the ‘My Friendly Garden Gnomes’ pattern were an obvious choice! Chrissy’s Gnome pattern is a printable PDF file that contains concise and clear instructions including well labelled diagrams and an ‘easy to use’ pattern template. After fully reading the pattern, I couldn’t wait to get started on my very own gnome. There are three sizes available on the template so I chose the 6 inch gnome. I was away from home when working on my gnome, so I decided to vary the pattern slightly and hand stitch it. I’m pleased to say that I didn’t even have to make any pattern modifications. You can see the detail in my blanket stitching here. This project was quick, easy, and fun. And I’m looking forward to creating a whole bunch of these little creatures. They’ll make a lovely Christmas display but would also be great as pin cushions too. I’ve named this little one ‘Gladwyn’. Chrissy has made the gnomes pictured on her pattern with some slight variations to the pattern itself. So some of the beards and faces in her images differ to those offered in the pattern. 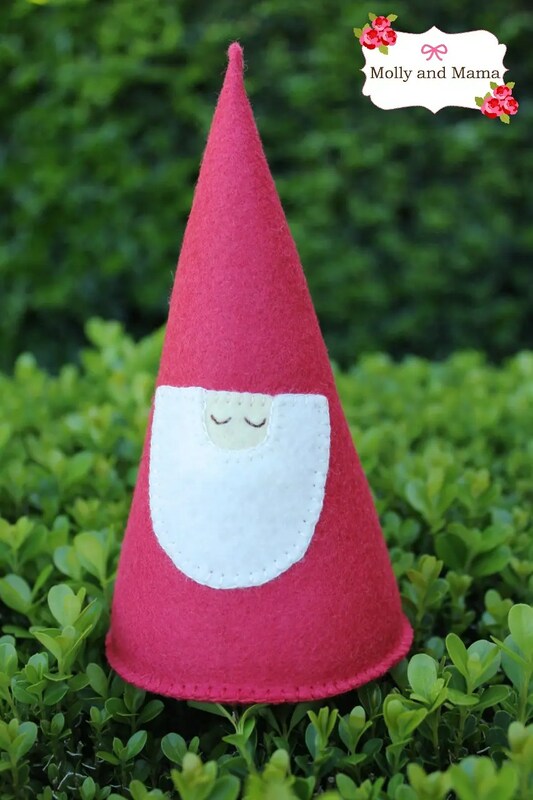 But the beauty of this type of project is that you can make some subtle changes to your template and stitching to really give each gnome his very own personality! So much fun! Chrissy’s pattern tour kicked off on the 1st of May. And let me tell you, it has been a wonderful journey exploring everyone’s blogs and reviews. There’s not long to go on the tour, but you need to pop by Muse of the Morning soon. Chrissy is giving 10 lucky readers the chance to score one of her patterns! Enter HERE. And if you can’t wait, be sure to visit her shop HERE. Use the code BLOGTOUR30 to receive 30% off her patterns during the Blog Tour. I love that you named your gnome!! Gladwyn is a great name. He looks adorable! Thank you for joining in my blog tour! !